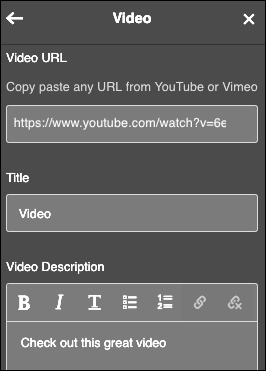 You can display a YouTube or Vimeo video on your website by linking to it on either video-sharing website. Click Video in right panel. 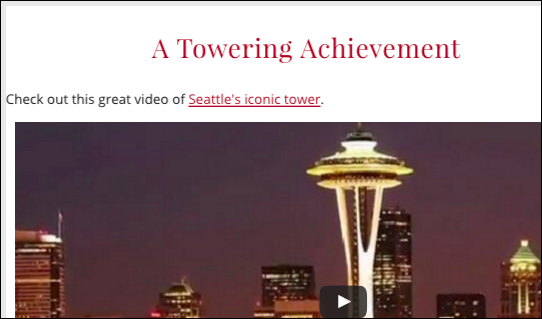 Click the placeholder video when it appears in the Video panel. When the Section Added confirmation appears, click the Video section in the right-hand Video panel and fill in the appropriate fields. 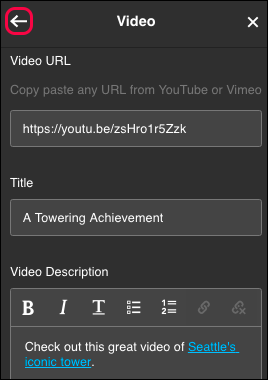 Video URL Replace the default URL by pasting in the URL you've copied from YouTube or Vimeo. Title Type in a title that will grab readers' attention. Remove Section Click the button if you no longer want the video to appear. Once you've filled in the fields, click the top-left arrow. A still-frame view of the video appears on the page; click Done (mobile phone) or Preview (desktop/tablet) to see the result. To make more adjustments, click Edit. When you're satisfied with the settings, click Publish Site or Publish.